With deep previous experience in wine making, our Cider Master Greg Gove is now producing ciders that uses New York-grown apples in three delicious flavors: Benjamin’s Best, Razmatazz and our Reserve cider. These ciders offer a natural gluten free option with no added sugars. 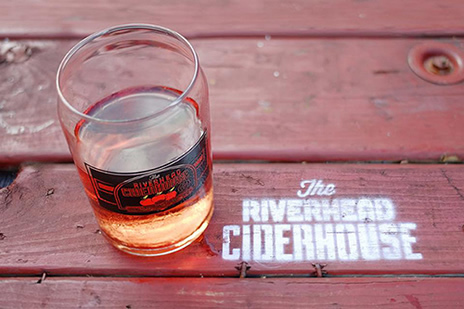 Complementing the overall tasting experience, Riverhead Ciderhouse is an 8,000 square foot facility with two floor-to-ceiling fireplaces that houses a tasting room, retail space and café, adorned in a décor of a natural rustic and brick setting. We are proud to serve fresh local produce indigenous to Long Island as part of the “Farm to Fork Revolution”, as well as gourmet pizzas, sandwiches and other seasonal fares with a single goal in mind - to support our local farmers, culinary experts, artists and customers. Our retail space at Riverhead Cider House will offer of local artist merchandise and boutique items as well as clothing items such as caps, hoodie sweatshirts and more. Last but not least, you can sample our apple products while enjoying our in-house entertainment, featuring many talented local musicians as well as our own two dueling, self-playing pianos.